Colorado is home to some of the nation's best-preserved cliff dwellings and American Indian archological finds. A tour around southwest Colorado leads you through the history of the Ancestral Puebloan, Ute and Navajo people and includes visits to Mesa Verde National park, museums and other amazing sites. 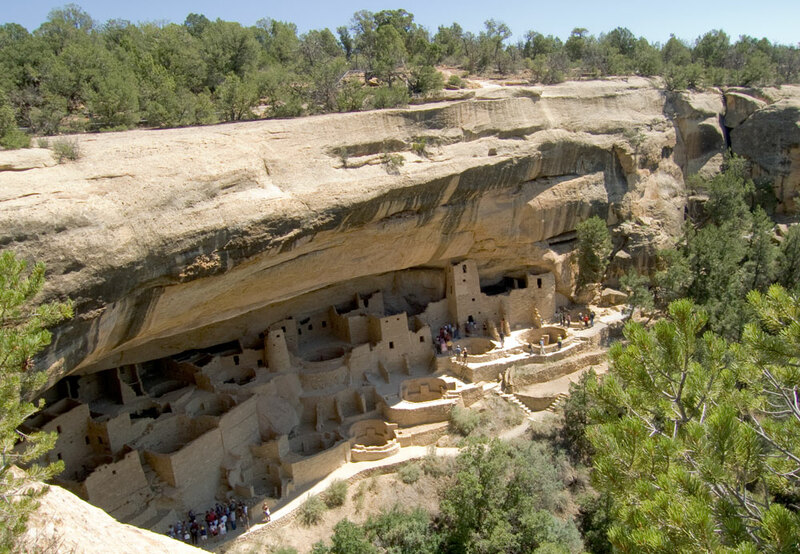 Just east of Cortez, visit the spectacular cliff dwellings and mesa-top villages in world-renowned Mesa Verde National Park, a World Heritage Site, voted the No. 1 historic monument in the world. Ranger-guided, self-guided, and half-day guided tours are available in the park. Enjoy dinner at the famous Metate Room with views that will take your breath away. Visit the Anasazi Heritage Center, an archaeological museum and the headquarters for the Canyons of the Ancients National Monument (north of Cortez). The center includes archaeological exhibits, hands-on activities, cultural videos and two small archaeological sites. Attend free American Indian dances and cultural programs at the Cortez Cultural Center in the evening (during the summer months). From mid-May to the end of September, take a trip back in time at Chimney Rock National Monument. This site, once home to the ancestors of the modern Pueblo Indians, is of great spiritual significance today. In September 2012, the area became the Chimney Rock National Monument. Travel on to Pagosa Springs, whose name is a Ute Indian word meaning “healing waters.” The hot mineral springs here are renowned for their healing qualities. Give them a try and learn the lore of the fight for ownership of the hot springs between the Ute and Navajo Indians. Drive from Pagosa Springs to Ouray, joining the San Juan Skyway in Durango, and follow it through Silverton into Ouray. As you travel along this All-American Road, often called “The Most Beautiful Drive in America,” reflect on this area from the perspective of the Ute Indians, who utilized these mountains as a summer camp for their family groups over the centuries. In Ouray, their hot springs also had special significance for the Uncompahgre Band of Utes. They called the hot springs “sacred miracle waters,” and used them for both ceremonial and healing purposes, even bathing their beloved horses in the steaming waters. In the late 19th century, Chief Ouray built a small summer home at the hot springs where the Wiesbaden Spa is now located. Visit the Ute Indian Museum in Montrose, one of the few museums in the country devoted solely to one tribe. The life and culture of the Ute People, the indigenous inhabitants of western Colorado, are commemorated in this museum. The grounds include the Ouray Memorial and the grave of Chipeta, wife of Chief Ouray. Travel on to explore Black Canyon of the Gunnison National Park. This steep, dark canyon has been a barrier to humans from time immemorial. Only the rim, never the gorge, shows any evidence of human occupation. Discover the Ute Council Tree. Dedicated in memory of Chief Ouray and his wife, Chipeta, this historic cottonwood tree (poplus deltoides) once stood nearly 100 feet tall, and it's been claimed that at this site he and his braves met with white settlers to smoke the pipe of peace and settle their differences. Chipeta was also said to have been the only American Indian woman ever permitted to sit in council meetings. Unfortunately, due to disease and concerns over the branches falling, the decision was made in August 2017 to remove the upper trunk and branches, leaving a 23-foot stump. The Delta County Historical Society has also placed a sign as a reminder of the site's cultural heritage. Venture into the frontier at Fort Uncompahgre in Delta on a site where Ute Indians and trappers once traded.